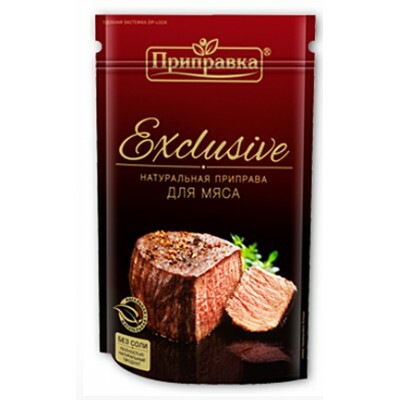 Seasoning "Exclusive" For Meat buy for 3.4900 in store RussianTable with delivery. New design which is made in shadow tones keeps succession of last design. It emphasizes product’s premiality and favorable points it on the market shelf. New package allows consumers notice the productand evaluate exclusive quality with transparent window on the back side. Due to height reduction the package became more compacted and it’s easier rack the product on the different types of the shelves. Convenient three-layer metallic material doypack with zip-lock. Ground coriander, Paprika (flakes), Dry ground onion, Dried garlic (ground), Basil, Ground ginger, Tomato powder, Ground black pepper, Marjoram, Ground chili pepper, Ground nutmeg, Ground cloves, Ground allspice, Dry parsley greens. Do you have any questions about Seasoning "Exclusive" For Meat?